Japanese readings are given herein. SUMMARY. This 7th-century Chinese translation from Sanskrit is perhaps the most widely known of all Jizō sūtras and texts. This 13-chapter sūtra contains the vows made by Jizō to save all sentient beings and stories about Jizō's prior lives before attaining enlightenment. Chapters 11 and 13 of this text mention the benefits that accrue to those who worship Jizō Bodhisattva. These benefits are translated below into English. There are numerous English names for this sūtra, including Sūtra of the Past Vows of Ksitigarbha Bodhisattva, Sūtra of the Past Vows of the Earth Store Bodhisattva, Sūtra of the Earth Store Bodhisattva, Ksitigarbha Bodhisattva Sūtra, Sūtra of Ksitigarbha Bodhisattva's Fundamental Vows, and less commonly the Earth Womb Sūtra. The Sanskrit text was translated into Chinese by Śiksānanda 實叉難陀 in the late 7th century, and in the following centuries entered Japan, where it was copiously copied and studied. The term Bodhisattva is rendered as BOSATSU in Japanese. * Below translation Mark Schumacher, culled from various others. * Also see English translation by Upasaka Tao-tsi Shih. * Also see English translation by Pitt Chin Hui. SUMMARY. The Buddha (Shakyamuni) says that devas, nagas, deities, humans, or demons who hear Jizo's name and thereafter worship, praise or show obeisance to images or sūtras of Jizō will gain the following seven benefits. This chapter is commonly known in Japan as the “Jizō Bosatsu Hongan Kudoku Kyō” 地蔵菩薩本願功徳経. The fruits of goodness & virture will shine increasingly on thee. The wisdom of the sages shall accumulate within thee. No retreat along the Bodhi path will be suffered by thee. Food, drink, and clothing will not be lacking thee. Disease and illness will not harm thee. Calamities of fire and water will not hurt thee. Thieves and robbers will not trouble thee. Respect from others will come upon thee. Demonic spirits shall (even) aid thee. Comely in appearance shall be thee. The role of monarch may fall unto thee. Wisdom from previous lives shall illuminate the future for thee. All those who beseech thee shall follow thee. A joyous and content family shall be granted thee. Chance, falsehood, and untrue doctrines shall cease to thwart thee. Eternal freedom from the karmic chain shall be thine. No obstacles along any path shall obstruct thee. Peaceful and untroubled dreams will slumber bring thee. Thy ancestors who suffer from evil karma shall be liberated. Reborn shall they be based on the good karma of thy past life. Praised by the sages shall become thee. Intelligent and wise in nature shall become thee. Rich in kindness and compassion shall become thee. "Even if the good deeds of beings are as little as a hair, a drop of water, a grain of sand, a mote of dust, or a bit of down, I shall gradually help living beings to liberation. World Honoured One (Buddha), do not feel distressed over beings in generations to come. Only after the hells are empty will I become a Buddha." If you find errors or omissions, please contact the translator. Vow 1. Tenryū. Tenryū is generally translated as gods and dragons, with the Japanese term TEN equal to the Sanskrit term DEVA, and the Japanese word RYŪ equal to the Sanskrit word NAGA. Both concepts are of Hindu origin, with Deva referring to “celestial beings” and Naga referring to “serpentine creatures,” including dragons. More specifically, however, the term Tenryū 天竜 refers to the Tenryū Hachibushū 天竜八部衆. These are eight classes (legions) of Hindu deities who converted to Buddhism after listening to a sermon by Shaka (Historical Buddha), and thereafter became protectors of the Dharma (Buddhist Law). See Hachibushu (Eight Legions) for details. It may also refer to the Eight Great Dragon Kings 八大竜王 (Jp. = Hachidai Ryū-ō) who are mentioned in the Lotus Sutra, which says the eight, each with many followers, assembled on Eagle Peak to hear the sutra as taught by Shaka (the Historical Buddha). Vow 11, From Female to Male. In orthodox Buddhism, only males could reach Buddhahood -- females could not unless they were first reborn into manhood (a higher state in the cycle of transmigration). In Japan, this transformation is known as Henjō Nanshi (変成男子), or “changing into a man.” This teaching lost much of its bite with the widespread popularity of the Lotus Sutra (法華経) among women of the Japanese court during the Heian period (9th-12th centuries). In the 12th chapter (Devadatta) of the Lotus Sutra, the daughter of the Dragon King Sagara attains enlightenment at the young age of eight, illustrating the universal possibility of Buddhahood for both men and women. Japanese ladies of the Heian court thus turned to the worship of the Lotus Sutra to ensure their salvation. Extant statuary offers even more compelling evidence of changing attitudes. In early Japanese Buddhism, the concept of venerating a female statue would have been unthinkable. 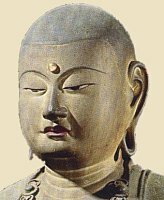 But by the 11th century, in both China and Japan, statues of Kannon Bodhisattva clearly portray the male deity as female. Indeed, a persistent femininity clings to Kannon imagery in both pre-modern and modern Japan. Today, Kannon is known as the "Goddess of Mercy" in Japan and the West. Note: Among Buddhist art historians, gender is not typically an issue. Statues are primarily portrayed as asexual or genderless. The artisans of Japan’s classical Buddhist statuary carved the faces, bodies, and robes (drapery) in ways that transcended male and female forms, in ways that avoided stressing a male persona. Nonetheless, the orthodox view (much weakened) is that all Buddha and Bodhisattva are male. One indication -- many Buddhist statues in Japan have mustaches. Vow 12. Female Minister to Kings. This is very puzzling, for in the prior Vow 11, the pious believer has assumed male form. Nonetheless, in Japan, women have held high roles in government, with some half-dozen serving as empresses. One example is Empress Suiko 推古, who reigned from + 592 to 628 and became one of Japan’s first Buddhist monarchs. After ascending the throne, however, she gave the reigns of power to her nephew and son-in-law, Prince Shōtoku, one of the loftiest patrons of Buddhism in Japan’s long history. Additionally, Jizo Bosatsu was sometimes reborn as a female in prior lives. Why the Number 28? This is not easily explained, nor is the answer definitive. The number 28 represents many different important concepts in both ancient cosmology and early Buddhism. In Chinese astrology, for example, there were four celestial “palaces” in the sky (representing the four cardinal directions), each corresponding to seven stations (or lodges) of the moon’s path overhead. This yielded a total of twenty-eight combinations. This scheme was apparently incorporated in early Buddhism, for Buddhism has 28 Heavens (Skt. = Devalokas), which include six of the desire world, eighteen of the form world, and four of the formless heavens. The list goes on and on. There are the 28 Patriarchs of Mahayana Buddhism, the 28 Yaksas (protective spirits), the 28 Legions protecting Kannon Bodhisattva, etc. It is thus very likely that the “28 Benefits” of venerating Jizō stem from the same influence. Jizo’s Tibetan Mantra for Eradicating Fixed Karma. Rough Translation: Om. Blame is greatly dispersed. So be it! Japanese Mantra for liberating beings from the hell realms. For details on the six realms (also called the Six Paths of Transmigration or Reincarnation, the Wheel of Life, or the Cycle of Suffering), click here. 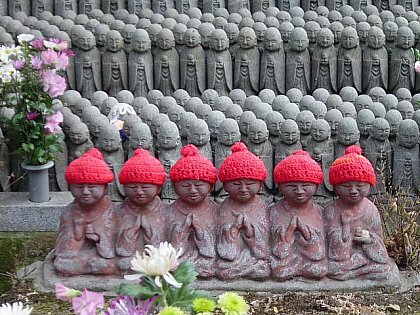 In Japan, groupings of six Jizo statues (one for each of the Six Realms) are quite common and often placed at busy intersections or oft-used roads to protect travelers and those in "transitional" states. Jizo also often carries a staff with six rings, which he shakes to awaken us from our delusions. The six rings likewise symbolize the six states of rebirth and Jizo’s promise to assist all beings in those realms. In Chinese traditions, Jizo shakes the six rings to open the doors between the various realms. Please see the Jizō Sūtra Page for all related texts. Jizo Bodhisattva, Guardian of Children, Travelers and Other Voyagers. A modern book by Jan Chozen Bays, a Zen teacher and practicing pediatrician.